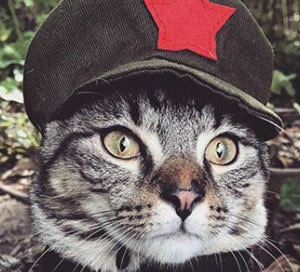 Read Chairman Meow’s tips, (including cost and how to cancel) and consider trying match.com out free for 3 or 7 days. Ready to join? Use a coupon or promo code for a 50-75% total discount on your subscription! 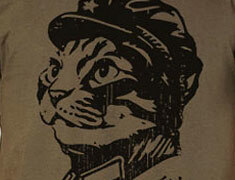 Well golly gee, I like cats, too! Apparently upwards of 14% of people think that cilantro tastes like soap. Personally, I think it’s a tasty addition to salsa, but roughly 1 in 8 people would strongly disagree. Well, that’s why there are vanilla and chocolate, and if the ice cream parlor offers free samples, you should take one. Same goes for dating sites like match.com. They are the biggest dating site out there, but maybe they aren’t your flavor. Match.com offers both a 3 and 7-day free trial with all the features so that you can try it for free before committing. When you sign up for the free trial, the clock starts ticking. For this reason, start the trial when your calendar isn’t too hectic. You’ll have anywhere from a free weekend to 7 days, so don’t waste it during a time when you are too busy to really get the most out of it. Send and receive emails from other Match members. Because, how are you going to start a relationship if you can’t do that? Track Your Match’s Every Movement with GPS – No, you can’t do that! What are you, Facebook? I don’t think the free trial is enough time to really build trust with other members, but it will let you experience how everything works first-hand. Plus, it’s fun to meet people! Hopefully, you’ll want to stick with match.com, but if not, just cancel before the free trial ends, or you’ll be billed for the next month! Much better than just a free weekend, the 7-day trial really lets you try out match.com and decide if you want to stick with it. Although most discounts and coupons applied just by clicking a link above, using a code for match.com is easy once you find the obscurely located “promo code” link. For a percentage-off coupon, you’ll be taken to the offer page with 3, 6, or 12-month subscription deals with the discounted pricing reflected from your promo code. As soon as you sign up, you have exactly 7-days to try it for free before you get billed. They literally bill you as soon as your 168 hours are up, so if you don’t like it, cancel at least a few hours before the free trial ends! A lot of the bad reviews for match.com are from people who got angry when their credit card was billed immediately after their free trial ended. Know exactly what you are getting your self into before entering any credit card info, and use a coupon or promo code to get the best price. Know that when you sign up, you’ll get a low, promotional rate (about $25/month) for up to 12 months. When that expires, you’ll be billed monthly at the retail price, which is closer to $50 per month. Learn more about the cost of match.com here. You can lock in the “new customer” promotional rate for up to 12 months at sign up. After the promo ends, you’ll be billed monthly at the regular cost. Match.com recommends the 6-month subscription because it’s not too short, not too long, and comes with their guarantee that if you don’t meet someone special, you get another 6 months free. I recommend not buying anything longer, because if you do meet someone special, you don’t want to be stuck with 9 months left on a pre-paid subscription. Also, go with the bundle, as it has more features and only costs $3 more per month. Yikes! That means you’re on the hook for the length of time you pre-paid, so you have to stick with match.com, or it could be a messy breakup! Surprise charges are annoying and hard to reverse. I recommend turning off auto-renewal in your account settings after you signup. This way you won’t get surprised with a monthly charge after your initial subscription commitment ends. 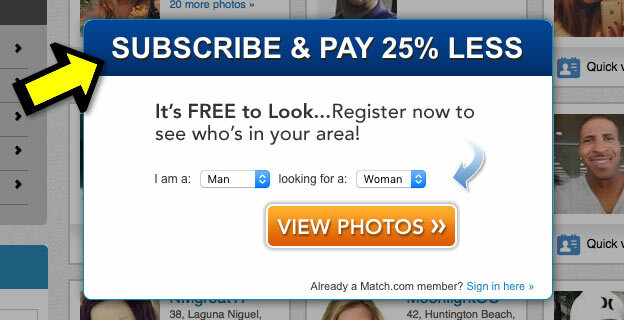 If you are enjoying match.com, you can always turn “auto-renewal” on again later. Match.com’s free membership is good if you want to dip your toe into the whole online dating scene, but you’d be better off signing up for their free trial (3-7 days) to see if you like it. The free trial includes more features, and you won’t feel like someone who brings their own popcorn to the movie theater. Tip #10 Don’t get Scammed on Match.com! Until cats rule the world, humanity will be deeply flawed. Scammers have realized that there are trusting and vulnerable people on dating sites, so they try to con them out of money. Never give out personal info on match.com or open shady links in emails. Also, that guy you met online isn’t really a prince in Nigeria, so be prepared for potential scams on match.com. Please don’t just go to match.com and pay full price. Even though they offer you discounted pricing, you’ll get an extra 25-50% off when you click one of our coupons. (see above) Usually, a promo code isn’t even needed, as the discount is applied when you click on a coupon!